HistoryIn 1975, Boris Popov of St. Paul, Minnesota survived a 400 foot fall in a collapsed hang glider. "As I fell," Popov explained, " I became most angry at my inability to do something. I had the time to throw a parachute. I knew they existed but they hadn't yet been introduced to the hang gliding community. My many years of gymnastics training conditioned me to prepare for the water impact, and allowed me to swim to safety minus a few fillings and a bruised kidney. 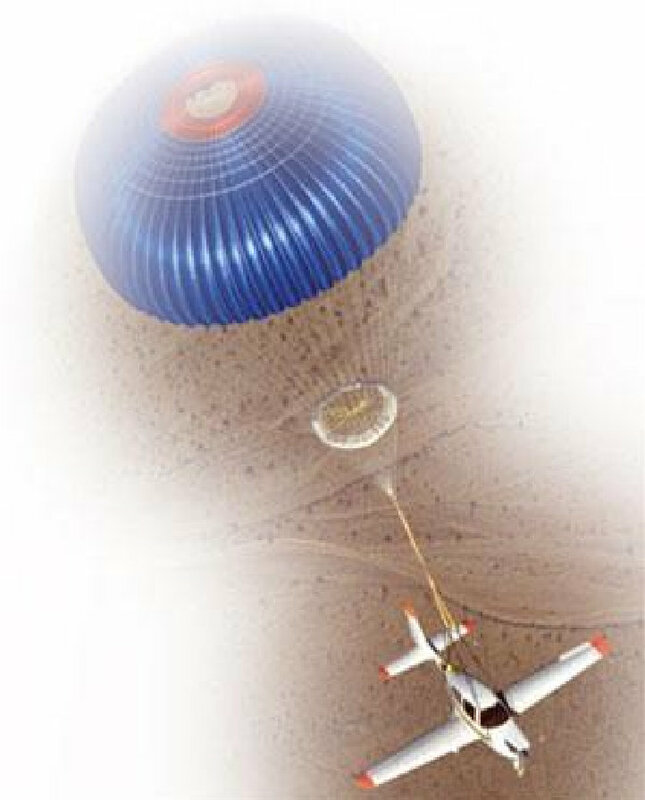 "Getting a Parachute OutRealizing the limitations of current parachute technology, he concluded, "It became apparent that only stored energy components such as solid fuel propellants could offer the power, low weight, low volume, and efficacy needed to rapidly deploy a parachute, but experts in the field told us it would be difficult to deploy a main canopy with any type of rocket device," remembered Popov. "As our successes grew with this approach, we slowly evolved from the drogue gun firing a one pound slug, to a solid fueled rocket that optimized the kinetic energy with a given mass," commented Popov. The team's resulting extraction device represented several breakthroughs.1) It had enough power to deploy larger chutes (even through entire fabric wings), yet it presented no recoil to the airframe;2) It was capable of deploying the chute in an orderly, systematic manner at greater distances from the aircraft;3) It was adequately safe and had proven reliability from military applications.BRS sells a range of rocket motors, and they are delivered with complete parachute system. The Parachute CanopyThe parachute had to be extremely light weight, low volume and be capable of packing into a small container. It would deploy quickly at slow speeds allowing for low altitude emergency saves, but slowly at high speeds, preventing massive structural failure of the canopy in high speed diving emergencies.After seven years and $1.5 million of engineering effort, BRS was granted the first-ever FAA approval to install a BRS ballistic parachute on a certified aircraft, the Cessna 150/152 series.The key to the success of this project was the ingenious development of a parachute reefing system. BRS eningeers Bruce Case and Phil Kadlec repeatedly deployed a sliding-ring device that performed all the functions required. This now-patented concept has since been included in most of the BRS parachute line, and has directly saved the lives of pilots and passengers throughout the world. This "slider," has enabled BRS to create larger chutes for faster aircraft. Why buy a ballistic chute? The following scenarios depict situations where the BRS system is most effective:1) Mid-air collision2) Single engine power loss over hostile terrain3) Single engine power loss during night flight4) Loss of control (due to icing or linkage failure) 5) Low altitude stall-spin6) Major structural failure7) Component failure resulting in an unflyable aircraft8) Pilot incapacitation (heart attack)9) Overshooting runway The system can function at altitudes under 300 feet AGL for the Cessna 150 (the altitude to which FAA certified the system), and as low as 100 feet for ultralights. The system can weigh as little as 15 pounds (ultralight), 45 pounds (Cessna 150) or 67 pounds (Cessna 172). Cosmetic appearance not a concern because the system is mounted internally on many aircraft and because of the use of the patented speed-sensing parachute, deployments speed capabilities are typically close to the maximum speed of the aircraft.Present And FutureBRS has won four SBIR (Small Business Innovative Research) awards from NASA to develop new exotic lightweight parachute cloth materials that may eventually allow cutting the chute weight by almost 50%. A later grant has BRS engineers investigating parachutes for light jet aircaft. Additonal developments can be expected. Today, BRS is a company of 25 employees and annual sales of about $7 million. Over 18,000 systems have been delivered.